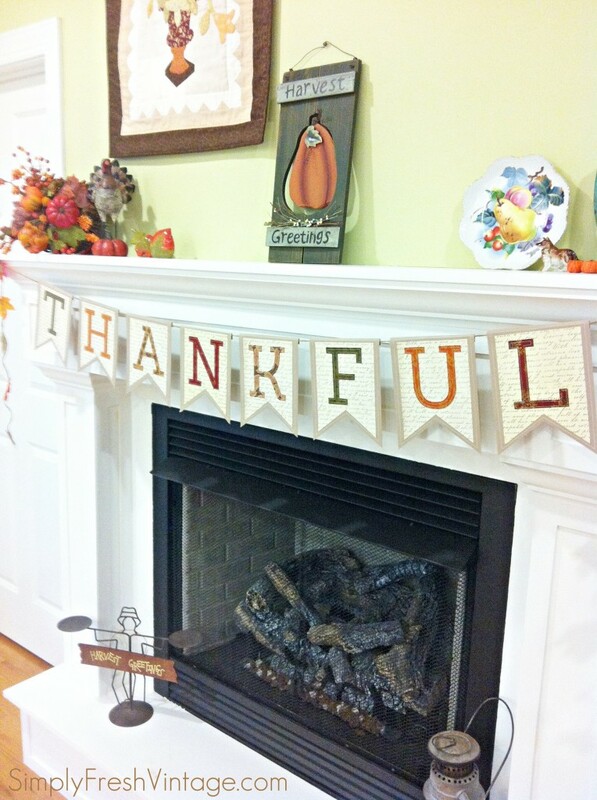 Last year I made a new “Thankful” banner / bunting for our fireplace. I had put up all of the “pretties,” but it was still missing something. So off I went to Michaels to see what inspired me. 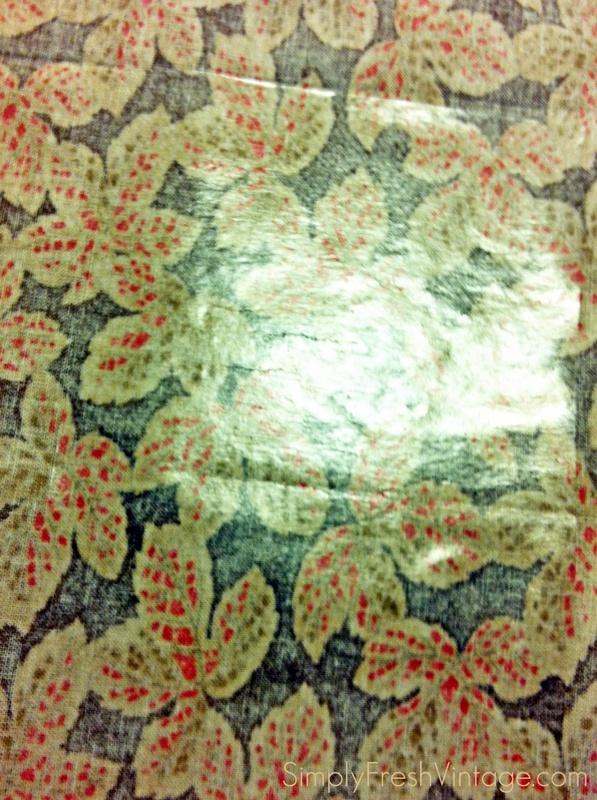 I came back with a few varieties of scrapbook paper and an idea. I wanted to combine my love for sewing with paper crafting, and at the same time add some fabric for texture. Before long I came up with a fairly simple plan. This tutorial will take you step-by-step through how to make this darling bunting. 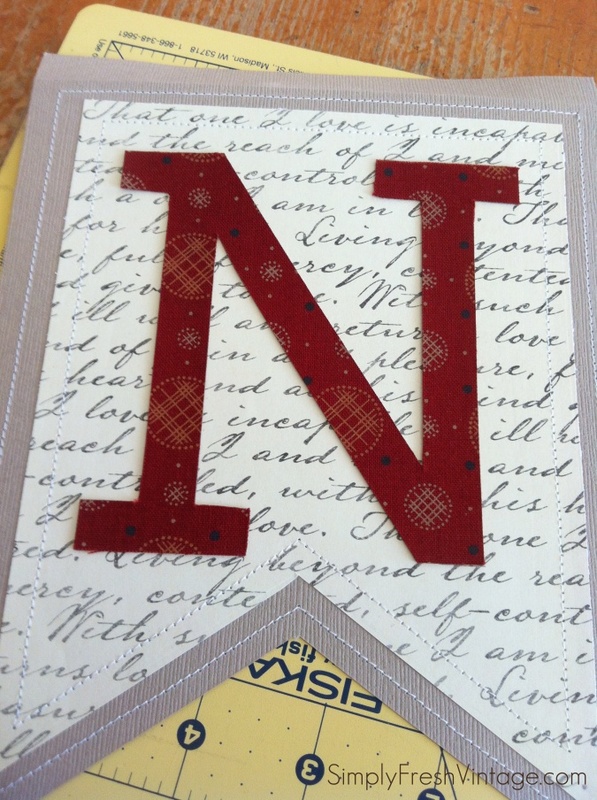 It can be customized for any holiday or occasion simply by switching out the paper and fabric options, and the letters. Once you get the first one under your belt, you’ll fly through the rest. 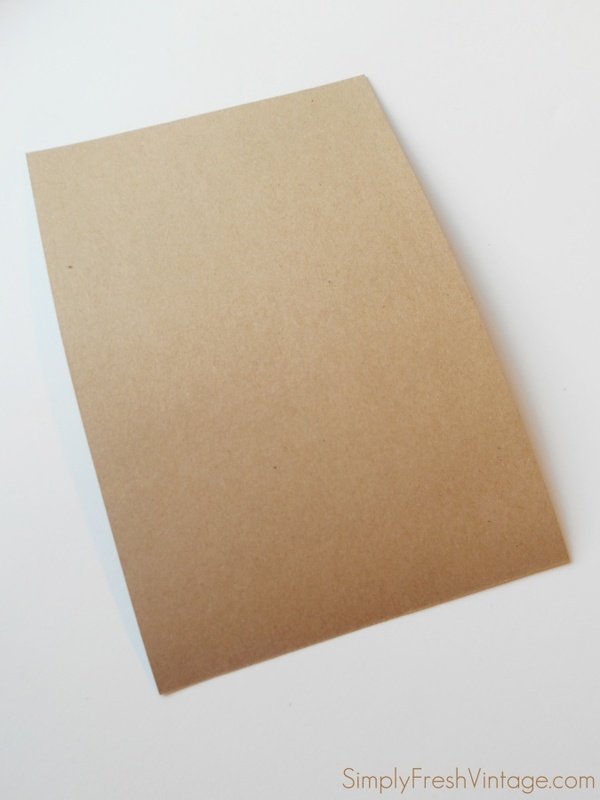 Scrapbook Paper … I used a heavier card stock for the base and a lighter weight print for the top. Template file (attached). Cut out the letters before starting. Instructions are for one letter. Repeat for all other letters. Picture will follow instructions. 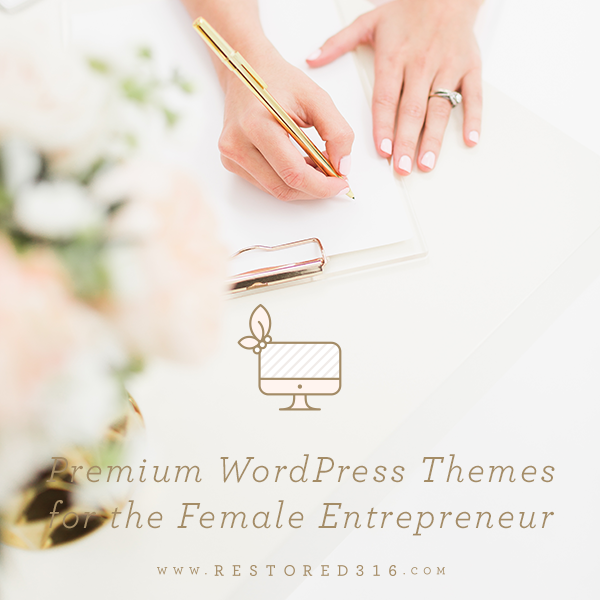 I’ve created a template and letter document for you to download for your personal use. 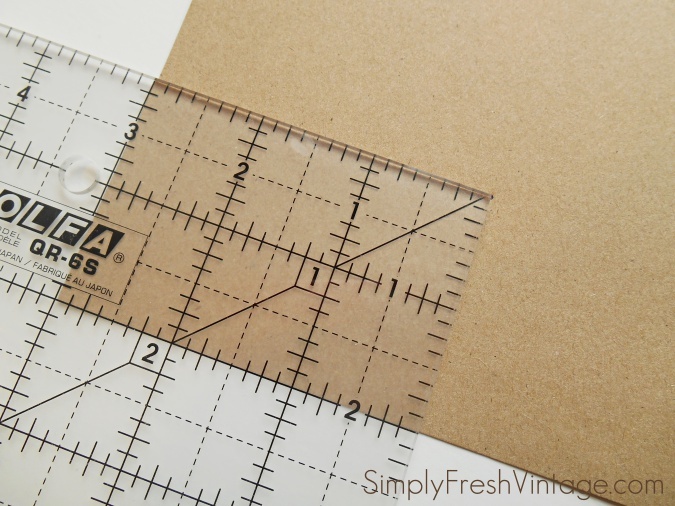 You can either cut out and use the template, or follow the measurements for cutting the foundation and top paper. I’ve also included the letters for “THANKFUL” for you to use. Click on the picture below to open and save the document to your computer. Step 1 … Cut the base 6″ x 9″. This should be a heavier card stock. 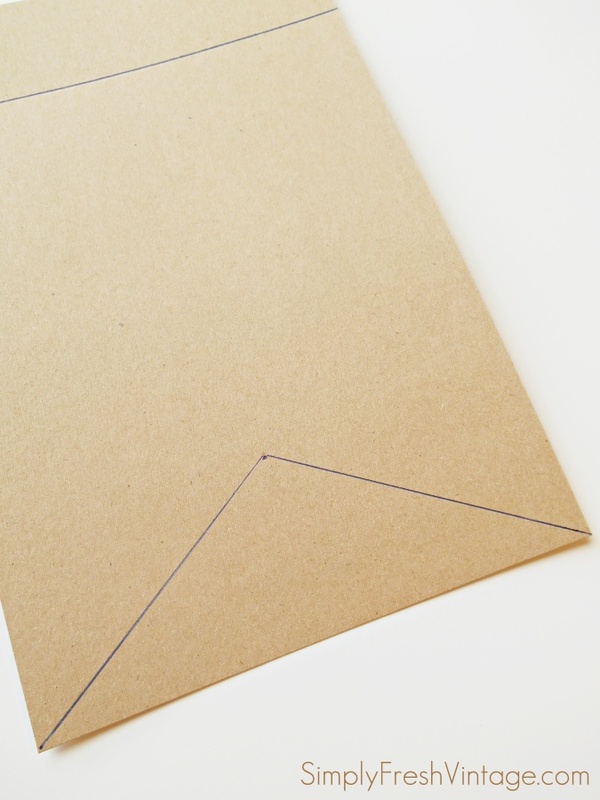 Step 2 … Draw a horizontal line 1-1/2″ down from the top. This is your score line. If you don’t have a scorer, you can press heavy a couple of times with a pencil to put an indent in the paper. Step 3 … On the back, line up a ruler 3″ over and 2″ up from the bottom. 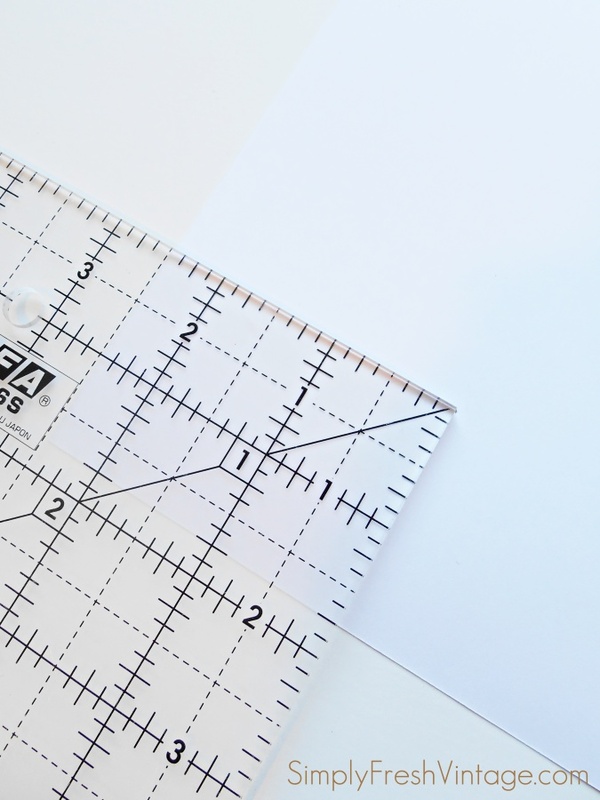 Make a dot at the top right point of the ruler to find the center. Step 4 … Draw lines from the bottom corners to the center dot. 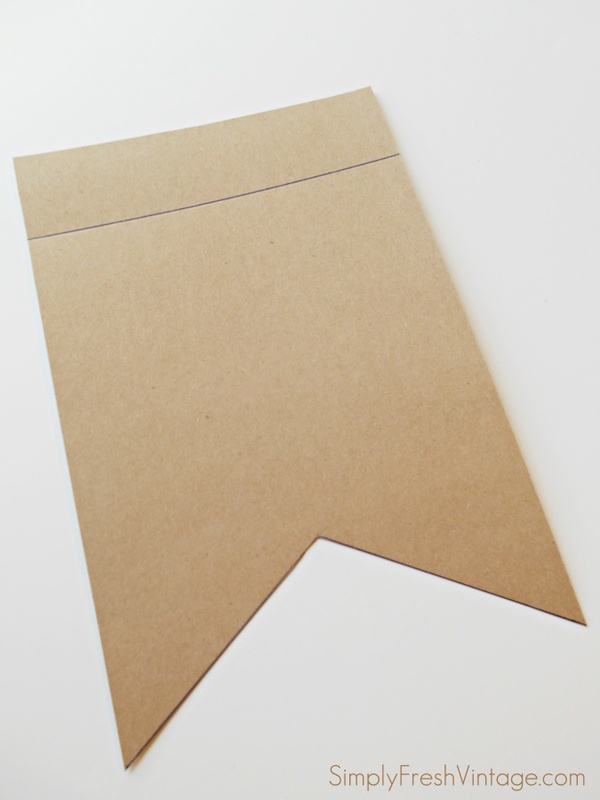 Step 5 … Cut on the lines. 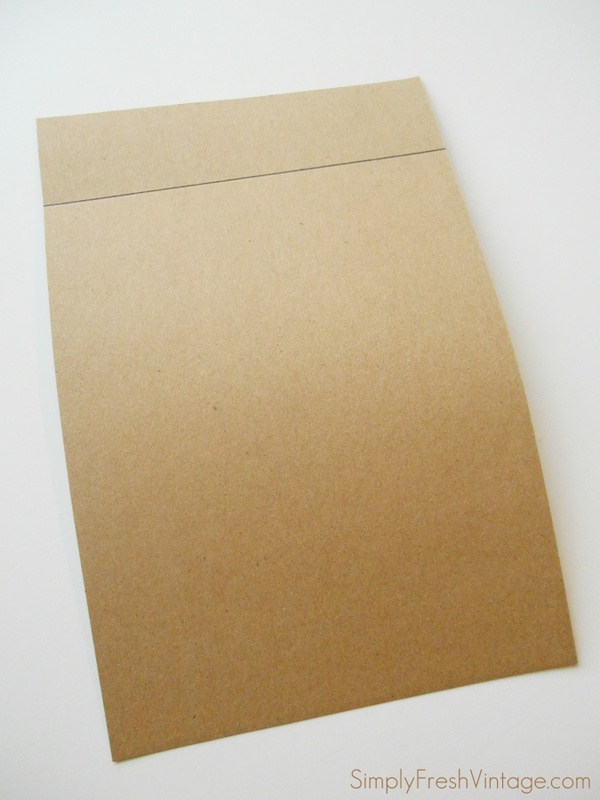 Step 6 … Cut your print paper 5″ wide by 6″ long. Step 8 … Draw lines from the bottom corners to the center dot. Step 9 … Cut on the lines. 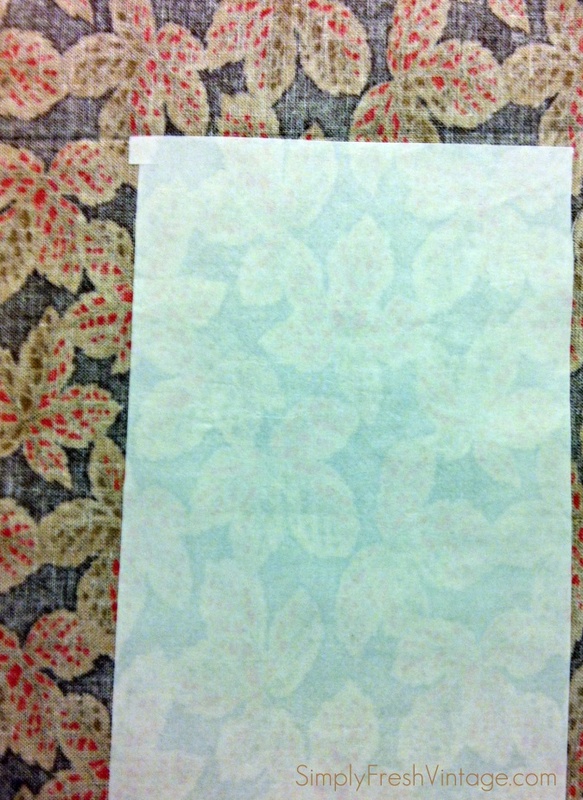 Step 10 … Using a glue stick or scrapbook stickies, adhere the printed paper to the foundation piece. Keep the glue away from the edges so that when you add the stitching the needle doesn’t get gummy. 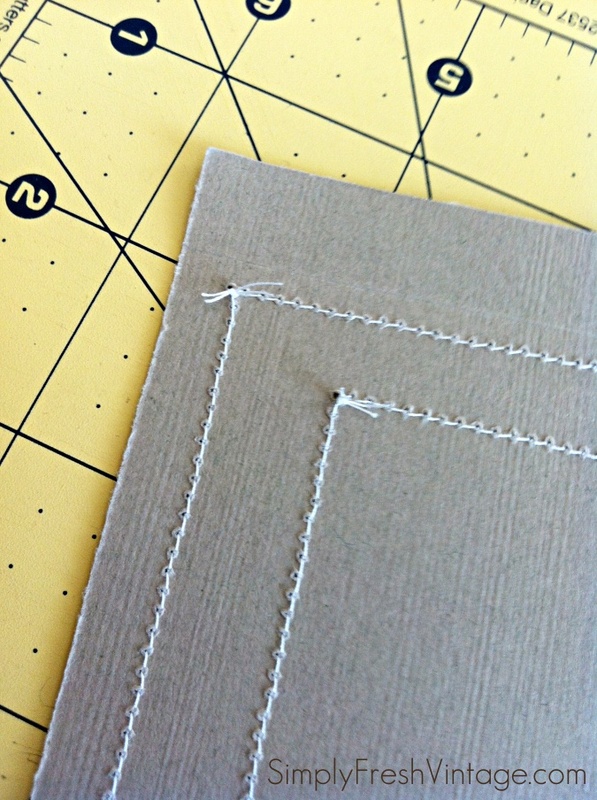 Step 11 … Cut out a piece of Wonder-Under about 4-1/4″ by 5″. Press it onto the back of a piece of fabric. Step 12 … Let it cool for a minute, then peel away the paper. Set aside. Be careful not to set your iron directly on the Wonder-Under … you’ll have a mess! 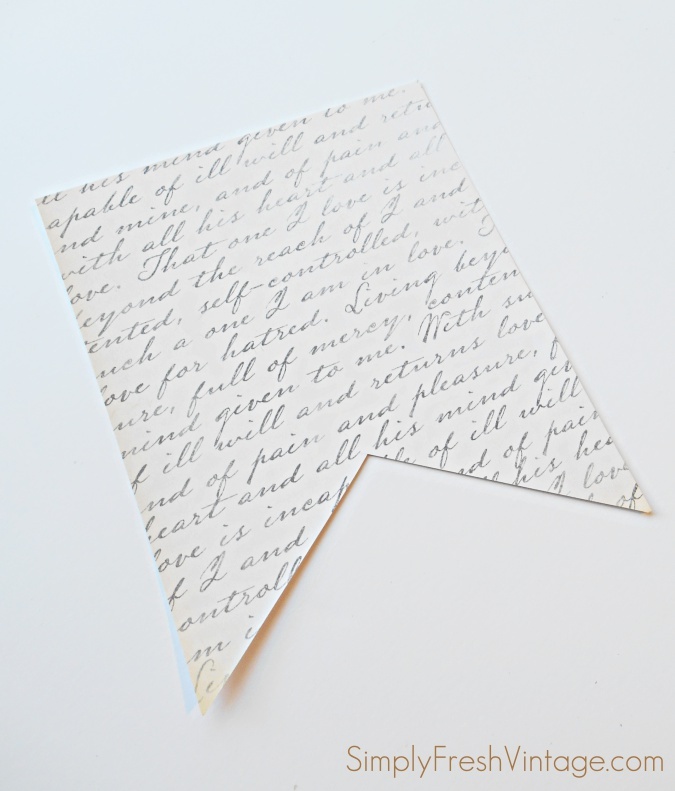 Step 13 … Cut a piece of medium weight paper the same size as the Wonder-Under (about 4-1/4″ x 5″). This paper does not have to coordinate … it will not be seen. 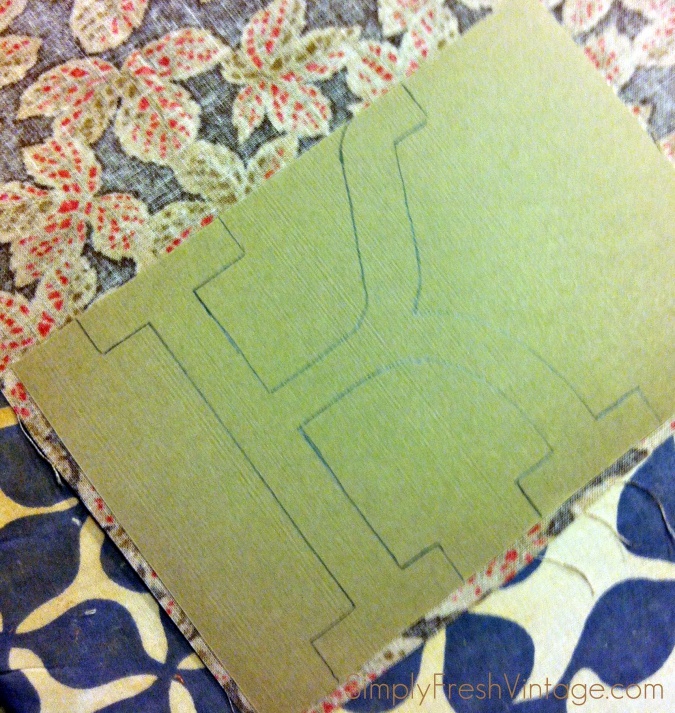 Trace one of the letters BACKWARDS onto the cardstock. 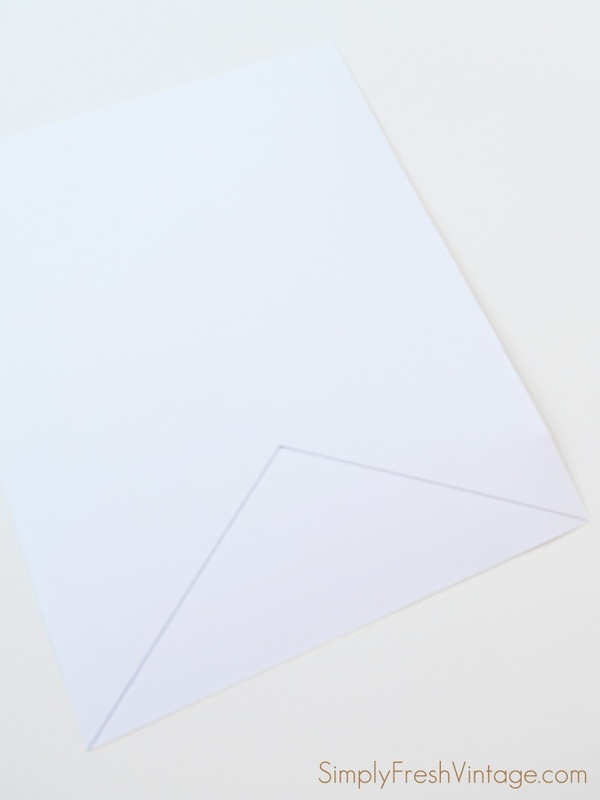 Step 14 … Lay the cardstock with the letter drawn over the Wonder-Under and press. This will give the fabric a little more stability which will aid in cutting. 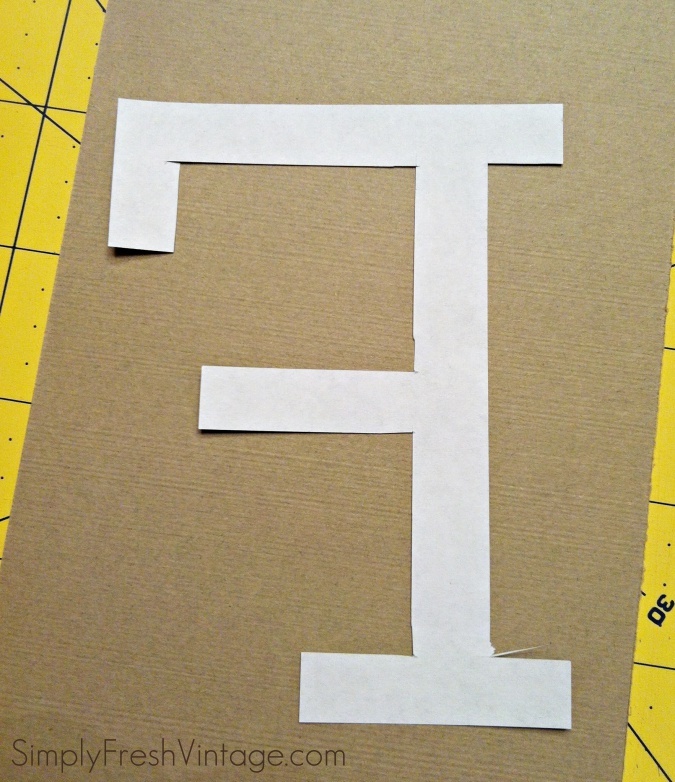 Step 15 … Using sharp scissors, cut out the letter. 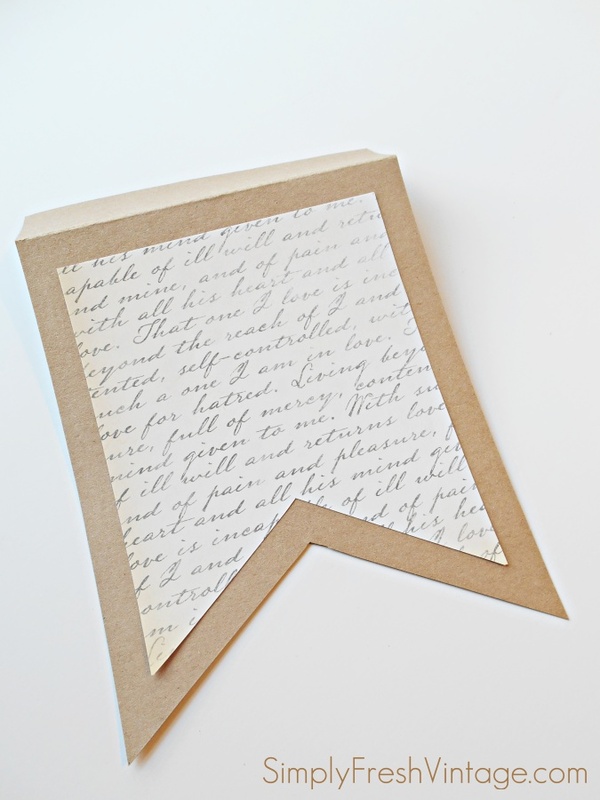 Step 16 … Using a glue stick or scrapbook stickies, center the letter and adhere it to the printed paper. 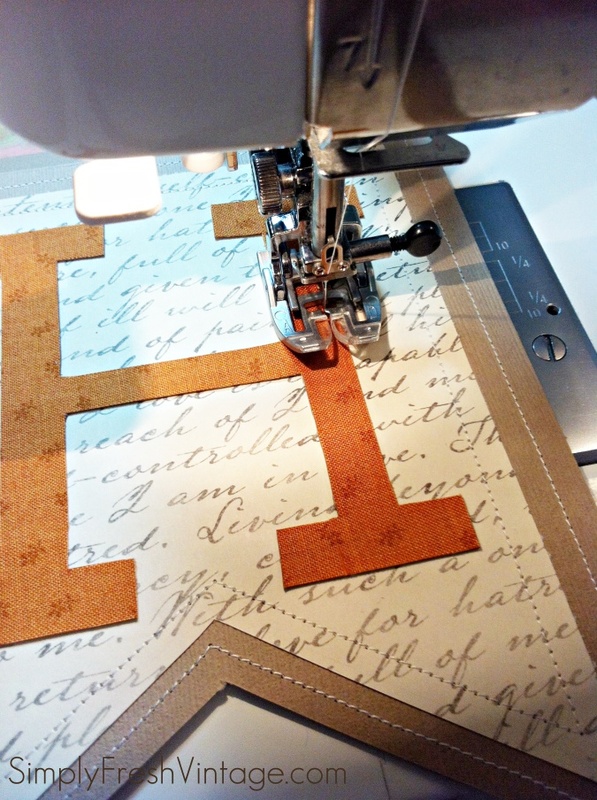 Step 17 … Take your banner over to your sewing machine and stitch around the foundation and around the printed paper, as shown above. 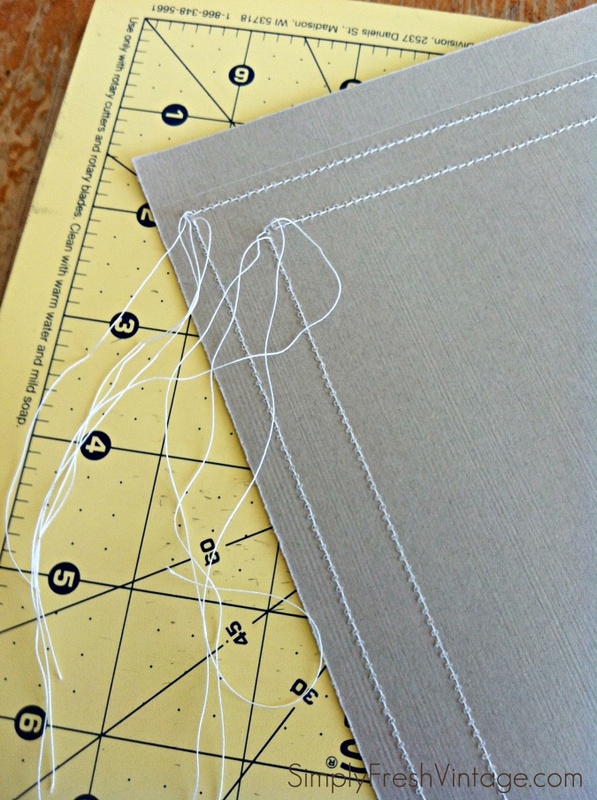 Play with your stitch size on a scrap piece of paper to get the stitch length you desire. I basically eyeballed about 1/4″ from the outside edge of each. 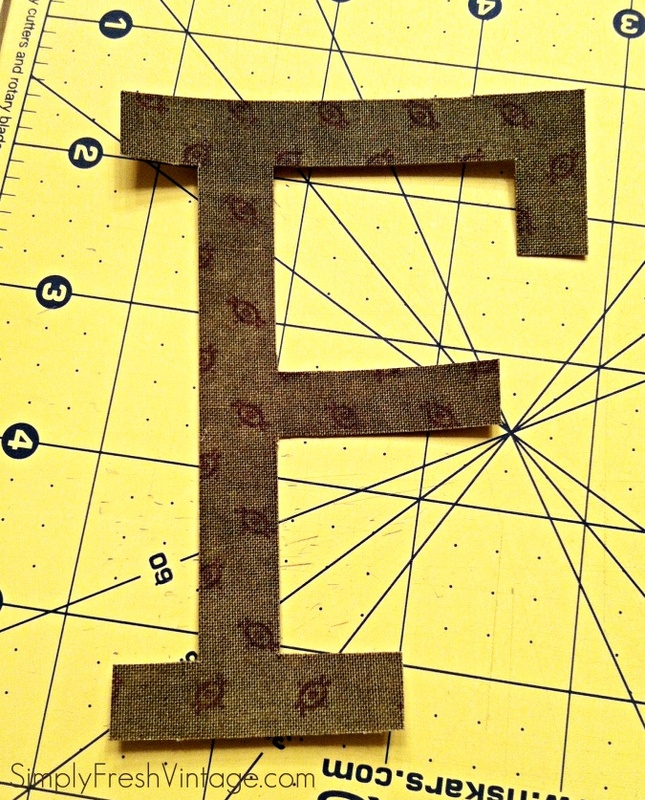 Step 18 … Then stitch over the letter, about 1/8″ from the outside edge. When you get to the end of a segment, stop with your needle down, lift the lever, turn the banner, lower the level and continue. Step 19 … Pull all threads to the back. Step 20 … Tie them in a double knot and trim. Step 21 … (pretending those threads aren’t there) Fold over the top and glue or tape down along the edge, leaving a pocket to string your twine or ribbon through. Repeat all steps for each letter. Step 22 … When you’ve finished them all, run your twine or ribbon, and hang them where desired. I hope you enjoyed this tutorial. If you have any questions, please feel free to ask in the comments. 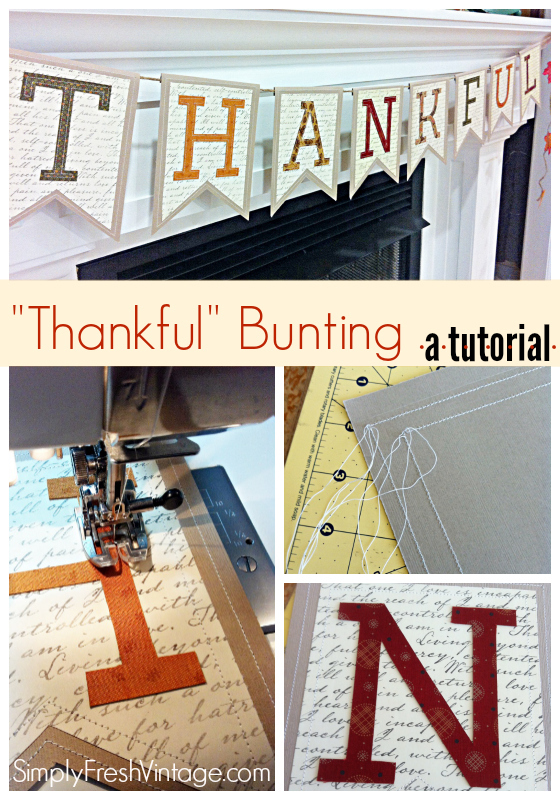 I hope you make your own “Thankful” banner / bunting. I’d love to see your pictures! 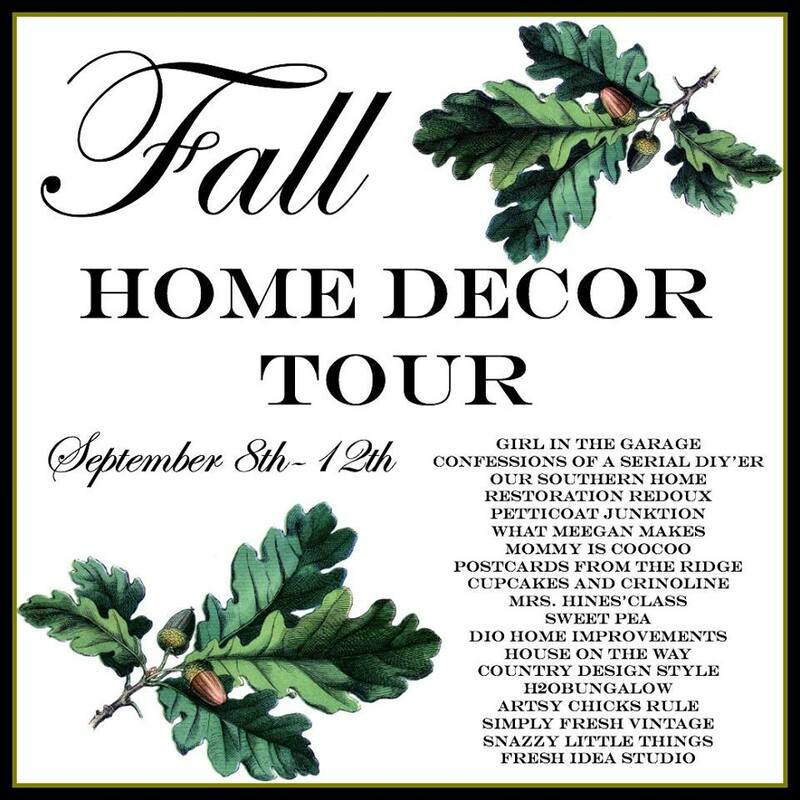 Here’s an amazing Fall Home Decor Tour filled with amazing projects that I know you will love! I LOVE the bunting – you are so very talented! This is a gorgeous bunting. Thanks so much for sharing. I can hardly wait to make one for our fireplace! Check out my mesh wreath post at http://happy2bahomemaker.wordpress.com/ and let me know what you think. Thanks! Thank you Tracee! I’d love to see yours if you make one 🙂 I’ll definitely stop by and see your wreath. Love the tutorial! I hope I get a chance to try it later this year. Pinning for later. What a creative idea! I wish I could sew like that. I love utilizing my mantle for fall and christmas decorations. Wow, that bunting is beautiful! And I MIGHT be able to do make one even lol. I love this Lani! So cute. Pinning! Beautiful! And it’s a great detailed tutorial. 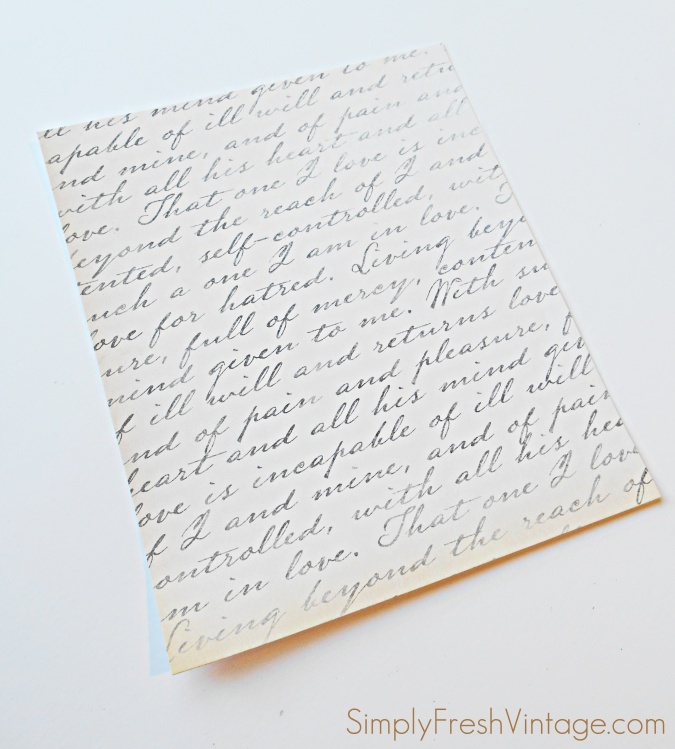 If you’re interested in new link parties, I’d love to have you over at Gingerly Made. There’s a party live now. Have a great weekend! Encouraging children – actually reminding all of us – to be thankful is such a worthwhile idea. 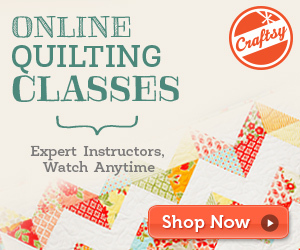 Shared your tutorial on a group crafts board on Pinterest. Came here via Crystal and Kelli’s Facebook group. I’ve saved your URL for the new CommentLuv bloggers lists I’ll be creating. If I can ever be of assistance please don’t hesitate to ask. Lani that banner is gorgeous! Awesome tutorial too. I would love this banner in my dining room 😉 you did a beautiful job! This turned out so pretty! Great step by step tutorial! Now I just need to get me a sewing machine! 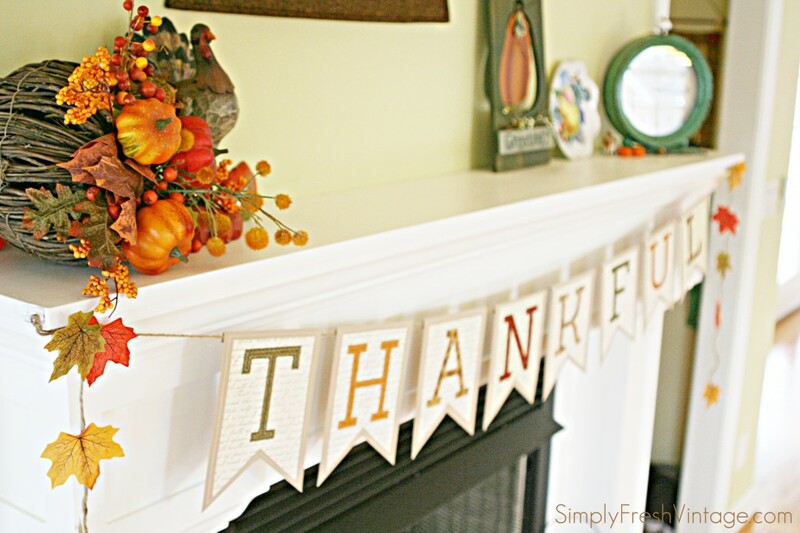 What a great idea for the Thanksgiving Mantel. And I have two months to get it done! I love your bunting! And thank you so much for the awesome tutorial! This has been an awesome Fall tour. Have a great weekend. I love all the detail you have on your banner. From the stitching, to the prints and patterns. It is a lovely Fall additon to any home. Thanks so much for the inspiration. Make it a lovely weekend. So adorable! My sewing skills are not up to par for this project, but I might try it without the stitching. Hi Susie! This would totally work without the stitching! What a beautiful banner! 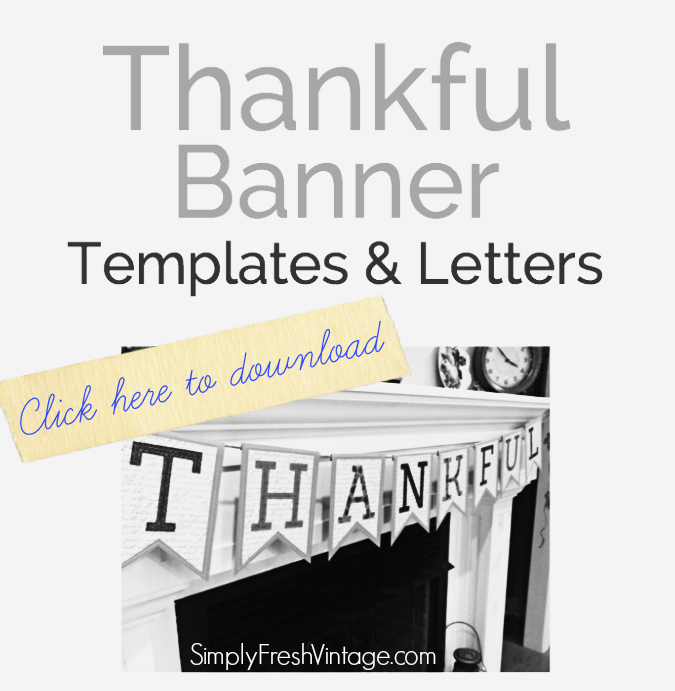 Perhaps we should all have a banner that reminds us to be thankful year round! Thank you so much Wendy! I agree with you … we all have so much to be thankful for, every moment of every day! Great detailed tutorial! Love the banner!! Your banner looks great! I love how you combined fabric and paper, and your tutorial was very well done. Thanks Jann! 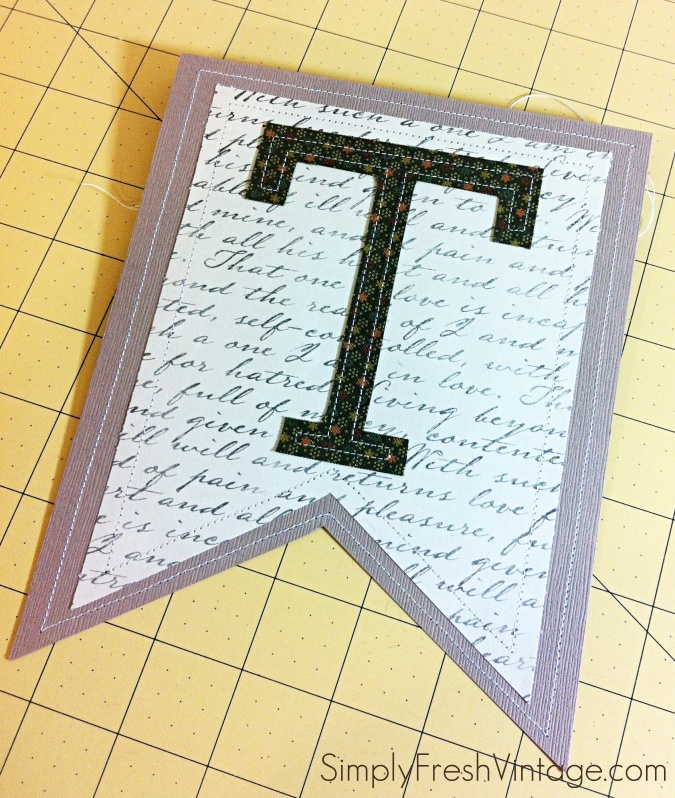 I loved adding the fabric … it added the perfect amount of texture that I was looking for! Wow! This looks so professional and pretty. Thanks for the excellent tutorial. Maybe I’ll sit down and make one like this someday after seeing how nice yours is! Love this! Thanks for the step-by-step directions. I would love to make my own!